COLUMBIA COUNTY, FL – Beginning in January of this year, the County 5 began planning for the September 6th budget hearing, the time when the tentative 2019 budget is brought before the people for a public hearing. On Thursday morning August 23, the final budget workshop/special meeting went on for over three hours. The 5 began with two budgets. By the time the end of the meeting rolled around, Commissioner Nash asked County Manager Ben Scott to prepare another budget, a third one, in time for the budget hearing, while at the same time it was decided that no more budget meetings were necessary before September 6. After over two hours of discussion, most of which revolved around the building and financing of the proposed new county jail, the budget busting project in which Chairman Murphy has been representing the County 5 while working hand in hand with his boyhood chum Sheriff Mark Hunter, the architect, the construction manager, the project super, and County Manager Scott at closed door meetings, Mr. Scott asked if there were any recommended changes to the budgets. Under Chairman Murphy's direct supervision, the Hunter Hilton jail project was already millions over budget before it had left the drawing board. His involvement and admitted knife wielding during these closed door meetings seems to flies in the face of the intent of the "Non-Interference" clause in the County Charter. Other than a handful of county staff members, members of the jail committee, the Sheriff, and Clerk of the Courts, P DeWitt Cason, the man who signs the checks, only two members of the general pubic showed up for the 10am meeting. 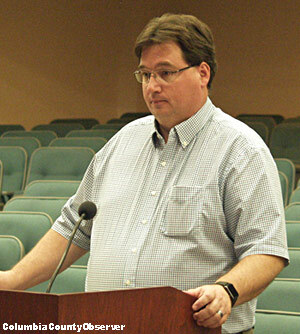 After County Manager Scott heard the request for a third budget, he looked like he was in shock. Two hours into the meeting Mr. Scott told The 5, "Now would be the time to present anything that you would like me to go back and massage or move around or reallocate. We have the first public hearing scheduled for September 6... We can still make changes in the budget at the first public hearing. We have to advertise on September 16 for our final public hearing... which we have scheduled for September 20th." Commissioner Nash addressed Mr. Scott, "I would like for you to go back and create a floor budget with no increases in general funds, transportation trust, and economic [development], simply because the two options that you gave us is contingent on leaving the millage where it is and the other one is contingent on the one cent sales tax passing, and we do not have an option if we choose to roll the millage back." One could see the blood leaving the County Manager's face as he listened to Mr. Nash's wish for a third budget. Mr. Nash continued, "Simply because you've got money -- what it does is my thing is -- you're allocating money to pay down debt and if it doesn't pass, we might not be able to pay down that debt. And you're goin' to have to create a cushion to be able to pay the jail debt and different stuff like that. If you did that it's around $1mil. Cutting the budget and reallocating money, so that gives us the option to look at that." A few minutes later, after a conversation about the County's utility loan, Mr. Nash began discussing the budget again telling The 5 that a bare bones budget really wasn't bare bones "because of contingencies and stuff like that." He continued, "All I'm doin' is puttin' the thought in the Boards' mind is that when you're lookin' at this... you have to anticipate what we're goin' to do in the future -- if you're gonna' tie your hands. Now I'm all about rollin' or cuttin' and reallocatin', but once you do that you're makin' a commitment to go through the year runnin' a budget the way you had it presented." "No more borrowing for the jail this year." Mr. Murphy explained his most recent budget meeting with the County Manager: "In my and Ben's meetin' yesterday. I'll just go ahead and give it out. I'm not borrowing no money for the jail this year. I'm not to the point to -- I'm not gonna' raise taxes to finance these issues when we're not in place ready to go. There's other avenues out there to be able to accomplish the economic thing [funding economic development]." As the meeting wound down there was more talk about the jail funding, economic development, and Mr. Nash mentioned his "little [budget] deals" which no one asked about. With most folks predicting the failure of the Infrastructure Sales Tax Surcharge, and the County 5 pondering an average $100 plus raise in the ad valorem property tax, the new Hunter Hilton, the County jail, is looking like a budget and quality of life buster for years to come. The population of Columbia County is approaching 70,000. The population of the jail, about 200. It may be time for some members of the County 5 to rethink their positions and priorities.